Magog is mentioned (Gen. x. 2; I Chron. i. 5) as the second son of Japheth, between Gomer and Madai. Gomer representing the Cimmerians and Madai the Medes, Magog must be a people located east of the Cimmerians and west of the Medes. But in the list of nations (Gen. x.) the term connotes rather the complex of barbarian peoples dwelling at the extreme north and northeast of the geographical survey covered by the chapter. Josephus ("Ant." ii. 6, § 1) identifies them with the "Scythians," a name which among classical writers stands for a number of unknown ferocious tribes. According to Jerome, Magog was situated beyond the Caucasus, near the Caspian Sea. It is very likely that the name is of Caucasian origin, but the etymologies adduced from the Persian and other Indo-European dialects are not convincing. In Ezek. xxxviii. 2 "Magog" occurs as the name of a country (with the definite article); in Ezek. xxxix. 6 as that of a northern people, the leader of whom is Gog. This "Gog" has been identified with "Gyges," but is evidently a free invention, from "Magog," of either popular tradition or the author of the chapter. The vivid description of the invasion indicates that the writer, either from personal knowledge or from hearsay, was acquainted with a disaster of the kind. Probably the ravages committed by the Scythians under Josiah (comp. Herodotus, i. 103, iv. 11) furnished him with his illustrative material. As contained in Ezekiel, the prophecy partakes altogether of the character of the apocalyptic prediction; i.e., it is not descriptive of events but predictive in a mystic way of happenings yet to be, according to the speculative theology of the writer. Winkler's theory ("Alt-Oriental. Forschungen," ii. 137, iii. 36) is that Alexander the Great and his invasion are the background. But this anticipates the development of the Gog legend, which, indeed, saw in the Macedonian king the Gog of the Biblical prophecy (see Gog and Magog in Arabic Literature). 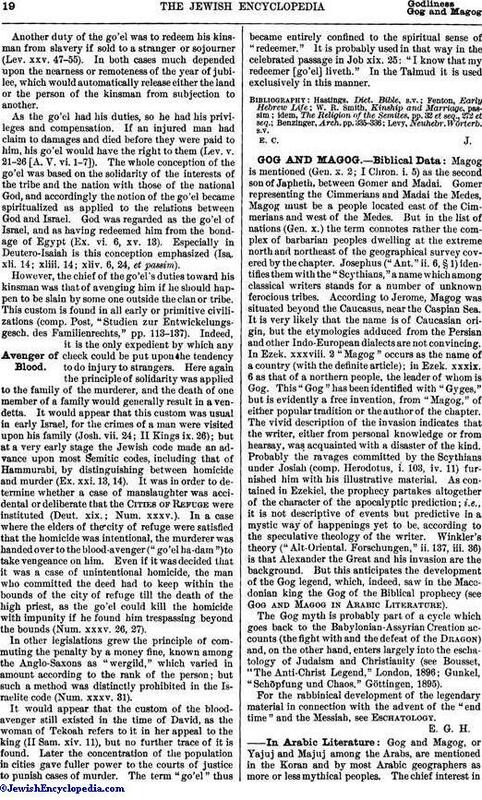 The Gog myth is probably part of a cycle which goes back to the Babylonian-Assyrian Creation accounts (the fight with and the defeat of the Dragon) and, on the other hand, enters largely into the eschatology of Judaism and Christianity (see Bousset, "The Anti-Christ Legend," London, 1896; Gunkel, "Schöpfung und Chaos," Göttingen, 1895). For the rabbinical development of the legendary material in connection with the advent of the "end time" and the Messiah, See Eschatology. Gog and Magog, or Yajuj and Majuj among the Arabs, are mentioned in the Koran and by most Arabic geographers as more or less mythical peoples. The chief interest inthem centers about two points: (1) the wall built by Dhu al-Ḳarnain (Alexander the Great) to shut them off from the rest of the world, and (2) their reappearance as a sign of the last day. Geographically they represent the extreme northeast, and are placed on the borders of the sea which encircles the earth. Descended from Japheth, son of Noah, they number twenty-four tribes. Six of these are known by name (one being that of the Turks); and the number of each tribe equals that of all the other people in the world. Some say that they belong to the Chazars, who are all Jews (Yaḳut, ii. 440). They are of small stature, attaining to only one-half the size of a man (another report, in Yaḳut, i. 113, makes them larger). Very ferocious, they have claws instead of nails, teeth like a lion, jaws like a camel, and hair which completely hides the body. Their ears, hairy on one side, are so large that they use one for a bed and the other for a covering. They live principally on fish, which are miraculously provided for them. They resemble animals in their habits; and Mas'udi classes them among the beasts. They used to ravage the country, devouring every green thing; and it was to prevent this that the people living near them begged Alexander to build the wall shutting them in. It is even said that they were cannibals (Baiḍawi). The wall is generally supposed to have been at Derbent, although in later times it seems to have become confused with the Great Wall of China (Abu al-Fida). The geographers frequently quote an account of it given by Sallam, the interpreter. The calif Wathiḳ Billah had seen the wall destroyed in a dream, and he sent Sallam to investigate. The latter recounts marvelous things of the countries through which he passed on his way thither, and gives a minute description of the wall itself. It was built in a gorge 150 cubits wide, and reached to the top of the mountains. Constructed of iron bricks embedded in molten brass, it had a peculiar red-and-black striped appearance. In it was an immense gate provided with a giant bolt, lock, and key, the last of which was suspended by a chain. Yaḳut remarks on this story that God, who knoweth all things, also knows whether it be true or not, but of the existence of the wall there can be no doubt, since it is mentioned in the sacred book. 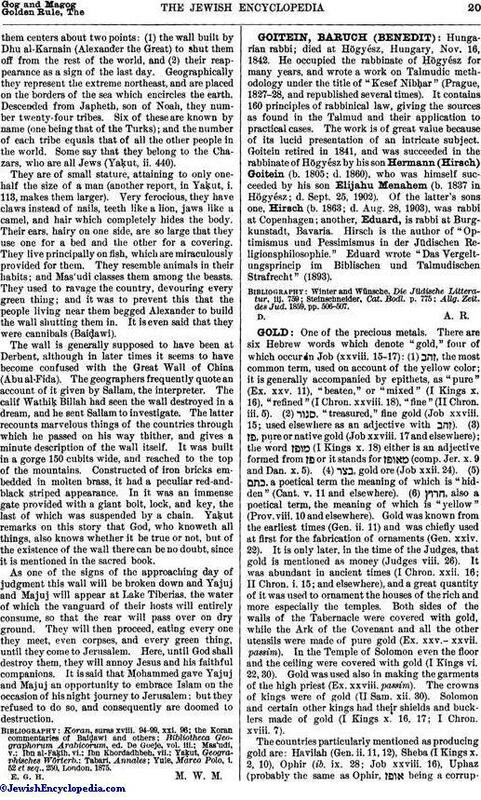 As one of the signs of the approaching day of judgment this wall will be broken down and Yajuj and Majuj will appear at Lake Tiberias, the water of which the vanguard of their hosts will entirely consume, so that the rear will pass over on dry ground. They will then proceed, eating every one they meet, even corpses, and every green thing, until they come to Jerusalem. Here, until God shall destroy them, they will annoy Jesus and his faithful companions. It is said that Mohammed gave Yajuj and Majuj an opportunity to embrace Islam on the occasion of his night journey to Jerusalem; but they refused to do so, and consequently are doomed to destruction. Yule, Marco Polo, i. 52 et seq., 250, London, 1875. E. G. H. M. W. M.